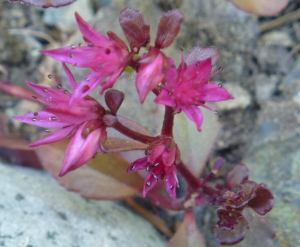 Sedum spurium ‘Voodoo’ – supposed to be the darkest burgundy of all the red spurium tribe, it’s actually a chance seedling from ‘Dragon’s Blood’ with many of its best characteristics, including its reliable flowering habit in bright pink. It’s one of the few grown from seed. I’ve seen this used extensively in single variety plantings in borders as a hit of colour or in containers with Sempervivum varieties that enhance the dark burgundy foliage. In mixed containers it's gorgeous draping over the edge, and it's superb as a foil with lime green or black foliaged plants. ‘Voodoo’ is also great in combination with grasses and other xeric plants such as Rudbeckia or Gallardia. As well as all it's other attributes, the color of the flowers are great too, as well as attracting many butterflies to the butterfly garden they provide nectar for pollinators. All around, this is a great little plant.